When I was still a child, I learned the secret of how to disappear. This was something of a miracle because I had always been too loud and too rough, with dirty fingernails and chronically bruised shins and a long golden ponytail that whipped around my waist when I ran. The only time that I was quiet was when I was reading. And I read the way some people breathe – necessarily and without effort. When I read, I traveled through time and space and in and out of reality. I returned to my own world fuzzy-headed, unsure of the line between what was real and what I’d imagined. This ability to escape through books was a treasure, but one day, I discovered that there were other ways to leave reality behind. I could do it anytime I needed to. I was born craving approval. From my earliest memories, I wanted to achieve perfection with every fiber of my being. I believed that I deserved love and acceptance because I made the best grades and won all of the awards and obeyed my parents and made everyone in my class laugh. But I was a child, and like all children, there were times when I got in trouble. When a teacher or my parents corrected me, I was devastated. I lived to please and when I didn’t I felt physically sick with the knowledge that I’d disappointed them. My heart would race until my chest hurt and my stomach would clench and I would imagine myself breaking into a thousand pieces. My body would shake and I would chant to myself, “I’m not here. I’m not here. I’m not here.” And then one day, I wasn’t. Or at least, part of me wasn’t. It was as if I was no longer quite connected to my body. I could hear my father’s words of anger and disappointment, but they seemed to be coming from a long way off. I was sitting across from him at the kitchen table, but I was also floating somewhere up in the corner of the room watching myself with cool detachment, protected from the intensity of his disappointment and no longer on the verge of breaking. This, I discovered, was an incredible skill. I now had the power to remove myself from whatever situations proved too stressful or upsetting to handle, and no one else would even know. I had learned to disappear in plain sight. I became so good at disappearing that I forgot how to stay put. I now know that this is called disassociating, but at the time I heard it called “zoning out.” I got into such a habit of disassociating that I found myself doing it not only when my stress level skyrocketed, but also when I was bored, upset, or feeling anything else I didn’t want to be feeling. All of this disappearing started to affect my memory. Although I graduated from high school only ten years ago, I have almost no memories of that entire chunk of my life, most of which I spent observing myself from a long way off. High school was possibly the most stressful time of my life as I tried to maintain perfect grades and perfect behavior while constantly trying to earn the approval of my parents, my teachers, my church leaders, and my friends. I lived in a state of constant and severe anxiety, which I didn’t even recognize as abnormal. I’d suffered from chronic tension headaches from the time I was in elementary school, but during my freshman year of college I developed a heart arrhythmia. It came and went, lasting anywhere from a few minutes to a few days. It felt like my heart would skip a beat, followed by an extra hard double-beat at the end of the overlong pause. Some nights I couldn’t sleep because each heartbeat was so strong it felt like it was echoing through my body, rattling my teeth, and making my limbs throb. “Premature Ventricular Contractions” the doctor said. Triggered by stress and anxiety. I told the doctor I wasn’t stressed or anxious about anything and that it must be something else. He said to drink a lot of water, replenish my electrolytes, and lay off of caffeine. Around the same time I started having stomach problems that I still struggle with. For weeks or even months at a time I would have chronic stomachaches that weren’t affected by what I ate or didn’t eat, by how much I exercised or how much caffeine I drank. My belly bloated and swelled until I looked like I was a solid 5 months pregnant, and most of the time I was in constant pain. This would last for long stretches of time until one day, just as unexpectedly as it came, it would stop, and I would live normally for weeks or months with no issues. I had learned to live with extreme amounts of stress so well that I honestly could not see a pattern of my anxiety correlating with my stomach problems. There were other physical signs that something was going on, but I simply didn’t recognize them as abnormal. I remember dozens of times when I would meet with a professor, spend time with a friend I found difficult to please, have some sort of confrontation, or be forced to participate in some activity that I didn’t want to do, and my whole body would tremble so hard that my teeth chattered. I would sweat through my clothes, the kind of sweat that stains, and afterwards, when I relaxed, my whole body would ache from the tension I’d been carrying. Now I realize that this was from an extreme amount of adrenaline my anxious body was releasing to help me get through an overwhelming situation, but at the time it never occurred to me that this was abnormal. It wasn’t until last spring, as we began preparing to move back to the States after two years in Korea, that I was finally able to recognize all of this for what it was – anxiety. As I started looking for a job and a place to live in the US, I was blindsided by a series of panic attacks that would strike without warning – at home, on the bus, at work. My heart would pound and I would feel like I was being stabbed through the chest as fears I didn’t know I had raced through my head. I thought we’d die in Korea and never make it back, or that we’d get back and not be able to find a place to live, or that I wouldn’t be able to find a job and we’d spend all of our savings and not be able to pay our bills and be miserable. Often these panic episodes would start completely unprovoked as I went about my normal routine. I never knew when they might hit and I couldn’t escape them by disassociating, and that was part of what made them so utterly terrifying. The panic attacks were new territory for me. I’d never thought of myself as an anxious person. I knew people who were anxious – people who could twist themselves up in worry over things that had never even entered my head. I always wanted to take those friends by the shoulders, maybe shake them a little, and remind them to RELAX. And suddenly, I found myself unable to relax. I wasn’t intentionally stirring up an anxiety and worry in myself; it was rising up out of the place it had been hiding for years. The panic attacks had one positive effect – they made me recognize anxiety for the first time and to realize that what I had been experiencing for so long wasn’t healthy or normal. As I started to look back over my life, I could see that anxiety had been my constant companion since childhood. I could see it in the way I chewed my fingernails bloody and how I laid in my bed at night as a second grader, praying for Jesus to return before I woke up. I could see it in the host of unidentifiable ailments, each one a physical manifestation of a level of stress that my mind and my heart simply couldn’t handle. Even though I was starting to see a pattern of anxiety in my life, I still thought the panic attacks were associated with the move and that once we’d settled down back in America they would subside. It’s been six months since we returned to the US and while the attacks have lessened, they haven’t disappeared. Sometimes we have to cancel plans last minute because I’m suddenly seized with the conviction that my husband will die if he leaves the house, and for the present I no longer stand in line at the bank or visit movie theaters because these places are triggers for me. I know that this all sounds very dramatic and maybe a bit depressing, but ironically, I’m feeling more and more hopeful. See, there is freedom in calling something by its name. Sometimes naming the thing takes away some of its power. When the panic attacks started, I couldn’t understand where they were coming from or why, and I felt powerless against them. Now I understand that anxiety has been part of my DNA all along. I understand that my habit of dissociating and my health issues have been a subconscious way of dealing with an unusually high level of anxiety from a very young age. Anxiety for me is mental and physical—it is not a conscious decision and it is not something I can make go away through force of will—but it is also profoundly spiritual. Learning to manage anxiety requires my letting go of the need to manipulate my circumstances and control every outcome. The anxiety itself may never go away (though I pray that it does), but I am coming to understand that I have a weapon that can keep me from being overwhelmed. Along with therapy for my mind and medication for my body, there is a remedy for my spirit and it’s called Truth. Anxiety shouts with a loud voice, but Truth always speaks louder. Truth says that the peace of God which transcends understanding will guard my heart and my mind. Truth says those who trust in the Lord will be kept in perfect peace. Truth says, “Fear not, for I am with you!” time and time again. Truth is giving me the courage to stay put instead of disappearing. It’s teaching me to accept my weaknesses and my limitations and to rely on a strength greater than my own. And it’s teaching me how to live well in a world where I’m not always in control. Today’s guest post comes from my friend, Sara. Sara and I went to high school together, but we didn’t really become friends until this past year when we reconnected through Facebook and blogging. I am constantly inspired by Sara’s outlook on her life, by the way she clings to faith in difficult times, and by her willingness and desire to do whatever God asks of her. She has such a beautiful, tender heart. I got chills reading this piece which brought me into her experience of living with a “disability” and reminded me of the God who is in the business of redeeming our brokenness. I remember the day I woke up and felt like my only hearing ear was stuffed with paper, or cotton, or wax. I remember the dizziness I felt as I tried to get out of bed that morning, unaware that my life would change forever as I lurched forward to vomit. Confused. Dizzy. Vertigo. I remember how it felt as people’s voices grew fainter and fainter and I grew angrier and angrier, placing blame at the people around me for my not being able to hear them. It was their responsibility to enunciate their words. It was their responsibility to stop mumbling. It was them and it was not me. I remember. I remember the look my doctor gave my mother and the tears in my mom’s eyes. The emergency overnight flight to Memphis and the 3 day hospital stay. I remember doctors talking all around me, tests being run every moment, people frantically trying to figure out what was going on and I was unaware. Unaware. They were unheard. She’s deaf. In her only hearing ear. Meniere’s Disease. Steroids. Diuretics. Exercise. Dizziness. Weakness. Sun that hurt. Feeling faint. So tired. More steroids. I remember. I remember looking at my mom as tears rolled down my face and I handed her the dry-erase white board I now used for communication scribbled with “Will this ever go away?” We cried. I remember the man who came to visit me who sat down in front of me and anointed me with oil. He prayed over me and though I couldn’t understand a word that came from his mouth, I remember. And smile. I remember my friends forming a fortress around me, getting out their cell phones and texting me so we could have conversations in the car… Conversations in the dark that anyone else could have heard, but me. We formed a clan that summer, a tight-knit group there to support one another, and those bonds – they have never gone away. I also remember seeing sign language for the first time and smiling as I thought “Wow, my life could really change if I knew that!” I remember learning and practicing so that one day I could communicate without reading lips or using my white dry-erase board. I remember the tender moments with Mom as she spurred me on to keep exercising. “Sara, I know you feel weak and dizzy, but you’ve got to keep on.” I remember with thankfulness. I remember my first hearing aid. I put it on and heard them for the first time in two years. Birds chirping. As birds chirped, my heart flooded with thankfulness. I’ll never forget it. Going deaf was the best thing that has ever happened to me. Even now, I open my eyes every morning and put my hearing aid on and listen. With my level of constant fluctuating hearing loss, some days I listen to the birds outside my window and can actually hear them. Other times, I can hear them only if I close my eyes tight enough and imagine. With a smile I feel my puppy’s steady breaths beside me and imagine what they sound like. I go to “Silent Dinners” that are literally just that, where instead of hearing with my ears, I hear with my eyes. It’s miraculous. I meet, talk, and bond with people I never would have known before. I feel thankful. I feel thankful when I chat with someone I know and they smile- through silent conversation. I feel thankful when I go to church and have the privilege to lead worship to deaf brothers and sisters in Christ who have become so close to my heart. Because they are my people. They are my people and their God is my God. I remember with thankfulness those 12 years ago when I was so sick and lost most of my hearing, then regained some. I remember with thankfulness, because that’s made me who I am today. Would I be where I am and communicate with those I do if that hadn’t happened? Would I see the deaf community as my own and be in their family? Even today, when I sit with hearing people at the dinner table and I get lost in their conversations, not knowing who’s talking about what or when. When my hearing loss threatens to isolate me from those I love most and I feel most alone. When I feel that I cannot connect with anyone. When fear grips me during a job interview when I realize a major part of the job is talking on the phone… I’m still thankful. I’m thankful because I get a just little glimpse in my adult life what people in the Deaf community have experienced their entire lives. I get that little glimpse and because of that, God has enabled me to minister, to develop the dearest friendships, and to love to the fullest. I wouldn’t trade it. Not for the world. 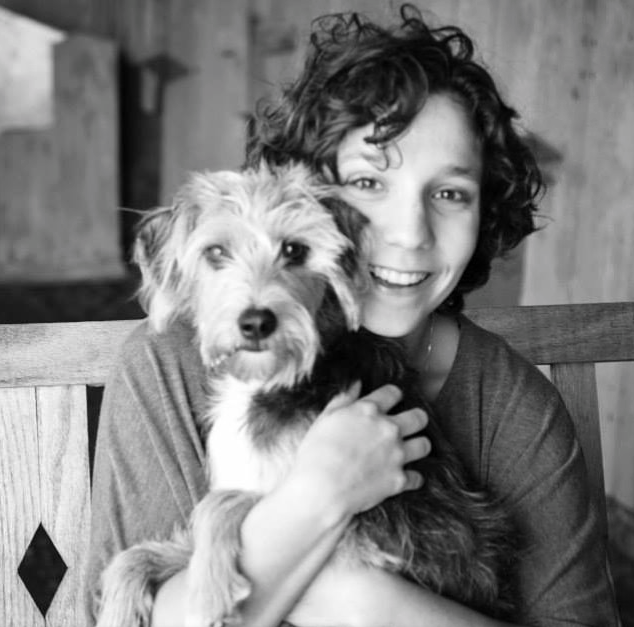 Author Bio: Since moving from her home in Louisiana, Sara has found herself living life in the mountains of east Tennessee with her puppy, Watson. When she’s not saving kittens from trees and puppies from rooftops, she’s reading about spirituality, love, and life and writing about life in her blog at scarmichaelblog.worpress.com. Today’s Thankful Thursday post comes from Crystal Tripp, a woman whose inner grace and humility seems to shine through everything she writes. I am honored to share this lovely reflection on what it means to choose gratitude. The obligatory Sunday visits completed-cards have been opened, gushed over, and filed away for safe-keeping. The flowers have withered. Another Mother’s Day has come and gone. Before long, the grills will be fired up & the ties will be retired to the back of the closet after their one time mandatory display around the necks of our fathers. Father’s Day will soon be a memory. These rituals play out in most homes across America and love is expressed whether true or feigned. I personally do not particularly care for these Sunday ceremonies as I believe the two people given the designation of my mother and father have long since let me down. As He is faithful to do, while typing that hostile statement, my heavenly Father speaks to me in that ever-present, still, small voice – reminding me that He has provided. I have not been forgotten. I often fall into the trap of discontent, thus allowing the seeds of bitterness to sprout which subsequently leads to a failure to live – essentially death. I am frequently reminded, like so many other things, gratitude is a choice. This choice (that I have to make on a minute-by-minute basis) has nothing to do with my biological parents (or anyone else for that matter) or even my particular life situation…it’s about me! In the middle of a seemingly ordinary life filled with mountains and valleys, I choose gratitude. I have countless things to be thankful for, too numerous to discuss here but in this season where moms & dads are celebrated, I choose to honor those men and women God placed in my life that have love for me beyond my comprehension. I know that my omniscient Creator hand-picked all of these people (including my biological parents) just for me – each with a unique purpose like a tapestry with bright and dark colors included to create the most beautiful picture. I am grateful that His thoughts are not my thoughts because I don’t always know or understand His plan. Wisdom has taught me that a life without gratitude is not worth living. That isn’t to say I am thankful for every situation and never express sadness or fear but focusing on my blessings allows me to keep it in perspective. I choose gratitude…I choose life. I had been eagerly waiting for Rachel Held Evans’ new book Searching for Sunday to hit the shelves ever since I heard that it was in the works. While I’m only an occasional reader of her blog, which is more issue-focused and, frankly, sometimes too abrasive for me read consistently, I was deeply impacted by her first book Faith Unraveled, which told the story of her transition from an utterly confident (sometimes judgmental) completely sure-of-her-own-rightness Christian to one who wanted to wrestle with hard questions rather than write them off. So many of her stories and experiences and reflections were uncannily similar to my own and that book was like water in the desert to my soul. For the past few years I’ve struggled with church. And even as I’ve tried to remind myself that church isn’t primarily about what I can get out of it and that not all churches are the same, I’ve felt an increased disinterest in participating in the church. This has become more of a concern recently as we prepare to move back to the US, a move which will necessitate our finding a new church. I’ve found myself reluctant to even try. By the time I finished this book, I felt understood, even validated. But I also felt hope. “We don’t want to choose between science and religion or between our intellectual integrity and our faith. Instead, we long for our churches to be safe places to doubt, to ask questions, and to tell the truth, even when it’s uncomfortable. We want to talk about the tough stuff – biblical interpretation, religious pluralism, sexuality, racial reconciliation, and social justice – but without predetermined conclusions or simplistic answers. We want to bring our whole selves through the church doors, without leaving our hearts and minds behind, without wearing a mask…. We can’t be won back with hipper worship bands, fancy coffee shops, or pastors who wear skinny jeans. We Millennials have been advertised to our entire lives, so we can smell b.s. from a mile away. The church is the last place we want to be sold another product, the last place we want to be entertained. “…what makes the gospel offensive isn’t who it keeps out, but who it lets in…. Evans writes about stepping away from the church for a while as she wrestled with questions that no one seemed to want to discuss and becoming critical and cynical about the body as a whole. I saw myself in this, the way I began to feel when I went to my parents’ church or my in-laws’, or visited a new church with my husband. I can’t claim that I agreed 100% with every single word and idea in this book, but that really doesn’t matter to me because I agreed wholeheartedly with the spirit of this book which was like an empathetic companion in my grief, an understanding friend, and sustenance for my sometimes starving faith. To me, the most beautiful thing about this book is that while it fully acknowledges the many problems with the church, particularly the evangelical church, it also leaves the reader with hope that maybe church can still be worth it. Maybe there is still value in this broken body. Maybe there is something so essential about the church that it’s worth investing in, in spite of all her failures. But this church that Evans writes about, this is a church I just might want to be a part of. The song makes it all sound so gentle. I picture those early morning rays on a peaceful beach, Jesus walking just a step or two ahead with me taking small steps into the footprints he’s left behind. The camera pulls back and we see an endless stream of footprints behind me and the horizon ahead, stretching on into eternity. It’s like a motivational poster in an elementary school classroom. But let’s get real here. For about the last ten years I don’t think God has been leading me step by step. It’s been more like cliff dive after cliff dive. I feel like old-school Mario, you know, before he could fly or turn into a penguin and skim across the ice on his belly. 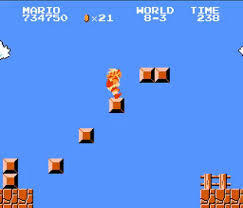 Old-school Mario had to jump to get anywhere and most of the time he was jumping from one inexplicably floating block of brick to another with lots of empty space in between. My friend Karissa recently wrote a post about some “Geronimo” decisions she’s been making. She explains these as the kinds of decisions that would normally require lots of planning, pro and con lists, internal debates, and lots and lots of detailed information. But lately, she’s found herself making some big decisions quickly and choosing not to regret or second-guess them. Decisions are hard for me too. I am often plagued with the fear of making the wrong decision. I’m afraid of making the wrong decision and regretting it later, but I’m also afraid of not choosing something and always wondering, “What if?” It’s hard for me to pick the restaurant for dinner or the movie we should watch or which jeans look better, so it’s surprising that most of my biggest life decisions have been Geronimo moments. They were moments where I took a flying leap and never looked back. At eighteen, I chose to go to college near Chicago, even though I’d never lived outside of Louisiana and had much better scholarship offers elsewhere. Jonathan and I got married at twenty-two with nothing but a crazy amount of love and two degrees that the ink hadn’t even dried on yet. The next year we decided to leave Illinois and picked a place on the map where we thought we might like to live. We showed up in Raleigh, NC, a city we’d never even seen before, with two cats, no jobs, and lots of dreams and it quickly became “home” to us. A few years later, we put all of our things into storage, found a long-term cat-sitter for our fur babies, said good-bye to our friends and family and got on a plane to Korea. We moved to a new country and a new culture that we knew next to nothing about and where we didn’t speak the language. Each of these were big decisions that we thought about and prayed about beforehand, but when it came down to it, we knew we just had to leap and trust that we’d make it to that next floating rock. Now we are preparing for another giant leap and somehow this feels like the greatest leap of trust I’ve ever taken. I’ve written a little about the anxiety I’ve been dealing with lately, but I am more afraid of returning home to America than I ever was of moving to Korea. More than all of the practical elements of our move to yet another new city, making friends, finding a new job and a new place to live, my biggest fear is that I’ll discover that I no longer belong. Already I have been struggling with feeling distant and disconnected from my friends. I have been coming to terms with the fact that going back to America will not just be like coming home. It will be the start of an entirely new adventure. And as much as I love a good adventure, this is the 4th time we’ve moved in 5 years and I’m tired of starting over. And yet, this is so clearly the path we are meant to take. It’s the next cliff we’re meant to dive off of. If there’s one thing I know about trust, it’s this. Trust doesn’t necessarily mean that you aren’t afraid. Trust simply acknowledges that there is something bigger than your fear. It recognizes that your fear is not the only thing and also that it’s not the strongest thing. Sometimes I wonder if we’re even moving forward. It feels like we just keep falling off things. And then I remember the immortal wisdom of Toy Story and think that maybe what we’re really doing is flying. 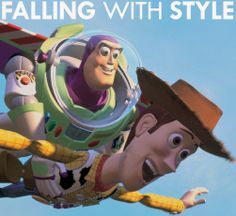 Because we know that flying is just falling with style. This post is part of a link-up over at Karissa’s blog about Geronimo moments. If you have your own Geronimo story, write about it and join the link-up!